Last week, about 22 of us went to a ladies’ luncheon at the Calabash Garden Tea Room in NC. A week or so before we got together and made Fascinators to wear. To say we had a lot of laughs doing that project is an understatement. 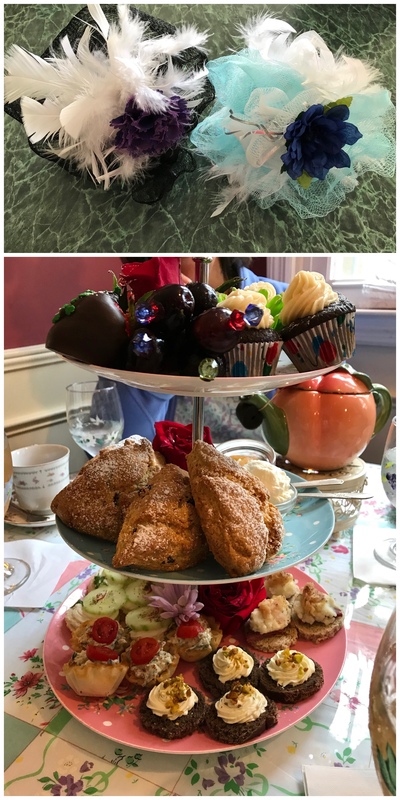 What a fabulous time we had making those little hats, getting dressed up, and enjoying our delicious high tea. There was a poster that Brookgreen Gardens was offering a Dirt N’ Details talk on water features so I couldn’t pass that up. We spent an hour with the owner of Peaceful Ponds while she gave us the fundamentals on putting in a pond or even a small water feature. The essentials are: choose plastic (unit or liner) over concrete because of maintenance. All systems need filtration, rocks, gravel, and a recirculating system. If large enough, fish and plants are a bonus. Research plants wisely though or they will become a challenge and need maintenance themselves. I also went to a sewing class with a friend on how to make a Brooks Bag. It is a nice big bag with four inside pockets and magnetic closure for carrying meeting or hobby supplies. One is finished, and one is almost done. It just needs the straps, closure and binding applied. Then I’m going to make a small zippered bag for each to carry cash and cards. There was one project I completed that didn’t involve flowers – a lazy susan basket. One morning to make it, and another morning to stain. It came out well, and I thoroughly enjoyed the process and the ladies I worked with. Did I mention that we have talented folks down here who are more than willing to share their skills? Sue, NH, plans and coordinates all our ladies’ luncheons, Marilyn, MI, teaches daily water aerobics, taught us to make Fascinators and also brings together talented ladies willing to share and plan classes. 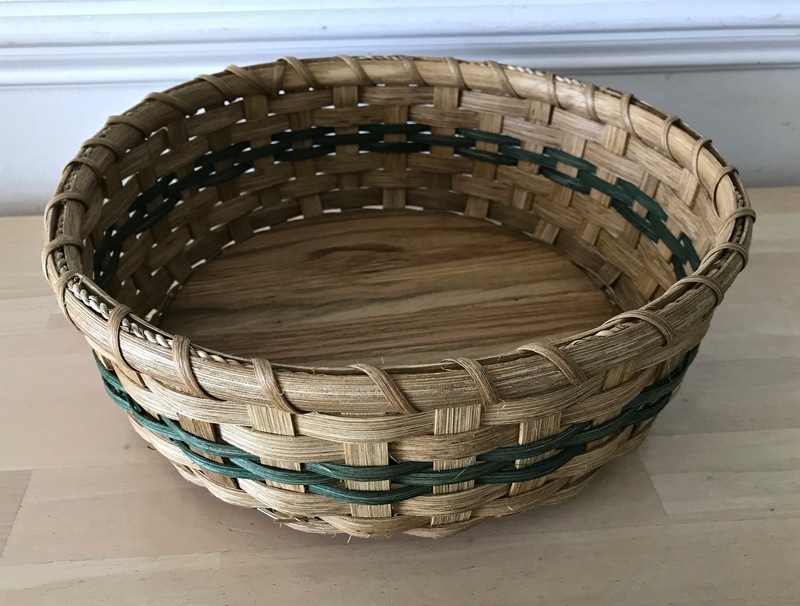 Jody, PA, teaches basket weaving each year, Cindy, Canada, taught us how to make beautiful greeting cards, and then there is a host of other talented ladies who make monthly gifts to be given away at our luncheons. 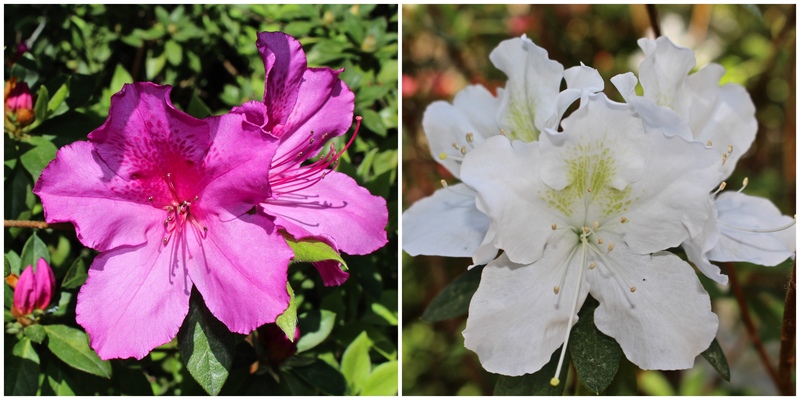 If I haven’t shown you enough flowered material, I can assure you there are azaleas in bloom everywhere I look. Beautiful. And, for those who thought a return visit to the Culinary Bakery was a good idea, we did. It was just as delicious the second time so just maybe we need to go one more time before we leave. A friend and I are off to Coastal Carolina Quilt Guild meeting this morning to admire the talented quilters sharing info and eye candy. Now, that’s a good start to my week, and I certainly hope you have a great week as well. This entry was posted in Quilting, South Carolina and tagged Azaleas, Basket, Brookgreen Gardens, Brooks bag, Culinary School, Desserts, Dirt N' Details, Gardening, Lazy susan basket, Quilting. Bookmark the permalink. I’m not surprised to read you have been knee-deep into creative endeavours! It sounds like a great way to share time with friends – old and new. Soooo – does this mean you will be adding a water feature to your property when you get home? I’m reading about what you learned about adding a water feature to your garden. If you do this I’m going to be following along closely. I’d like to have one but have hesitated, so you go first and I’ll see how it works for you! That one little suggestion about putting the plants in pots was priceless. Maintenance would always be an issue for me and this is one of those nuggets of great wisdom. Isn’t it amazing that so many are willing to share and teach their creative techniques to others. I am happy to see that you are having fun and learning and doing at the same time! Your purses caught my eye… quite beautiful and done quite nicely. Flower therapy is always needed! Thank you! The idea of a little pond just enchants me! Think of the sweet little birds who’d come to bathe and the little toads who’d take up residence! I’ve always been envious of people who had those! But mostly, what a community of fun, talented ladies you have there to learn from, travel about with, and look forward to seeing again and again every year! You have been busy, in the best kind of way. Yay for creativity! Mine runs toward writing and cooking, and that’s what I’ll be doing this week. I just new the bags you made and the basket would be to die for! You certainly chose the perfect fabric for the bags. You are a multi-talented gal, my friend. I love to see water ponds in yards. And I love watching the birds, and bees, enjoy the fresh water supply. Better than TV. I hope you can create one. But you do realize that once you have one, you’re gonna want another one in a different part of the yard! Lol. Those pastries look so darn good I think I gained a pound or two just looking! Yes, one more trip (at least) to the bakery will definitely be needed. You know, for road trip food. Lol. Ummmm, ‘knew’, not new!! I’m blaming it on Monday. That’s my story and I’m sticking to it! Nothing but work, here, Judy. Your hobby time is making me as jealous as the spring flowers. Great job on that bag. Will you be adding a water feature this summer? We added several battery operated outdoor lights. Not having to run wires was a blessing. Good luck. During those years I lived in California, I was mesmerized by the sound of water in so many places. It was wonderful. I had a small fountain in my garden there, and it was dream-like. I will be watching your blog for further developments. Sounds like work, but then so does everything else you manage to do with apparent ease! 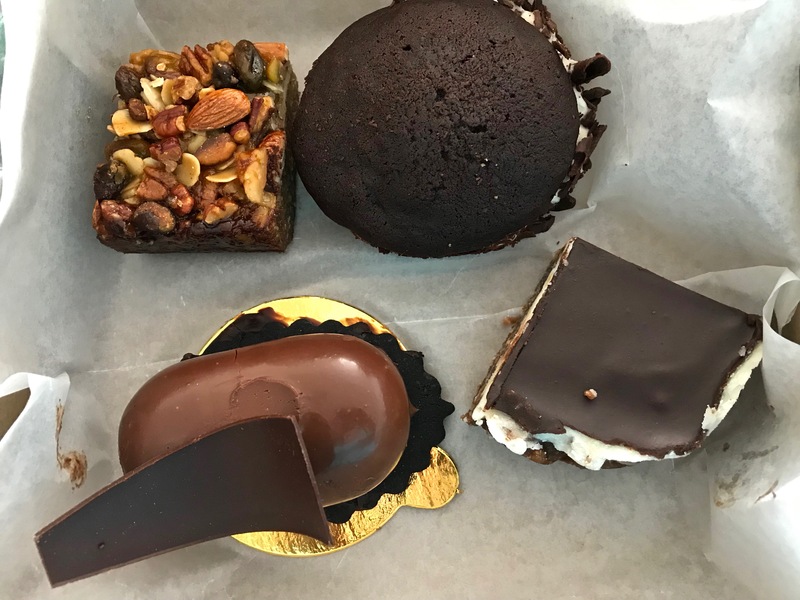 By the way, your comment about how you just might have to go back to the Culinary Bakery for one more taste (in the interests of science, of course) was not lost on me. One must always honor priorities no matter the sacrifice. Also I covet that white azalea. I know, I know, culinary sacrifices must be made by someone, so why not me. 🙂 That white azalea was unbelievably beautiful. Oh, I love your bags! I think the idea of having a little bag for cash or makeup is grand! I once got a bug to make some totes. It had inside pockets and a zipper pocket inside. OH. MY. GOSH! Was that ever so taxing for me! I think I’ve told you I find it very challenging to sew. My mother can sew beautifully, but not me. I spend most the time ripping out and cussing to get any project done. But, where is the image of you with your fascinator? Did I miss the post where you shared what it looks like? Ponds are so worthwhile! We have a wildlife pond, a raised formal pool and a little rill which all add their own characters to the garden. And the wildlife will find your pond straight away and love it! Your bag and basket are amazing, Judy, but the desserts vie for first place in my heart (or stomach.) 🙂 Glad you’re keeping busy. I’ve been busy with taxes today, getting everything (and there’s a lot) organized to send to our tax preparer. I will be SO glad when that’s done and in the mail. Hopefully we won’t be sending any additional funds to the government. Hooray for school vacation!! At the class, she actually showed a small black tub sunk in the ground with a large two piece bird bath in the center. In the black tub was the pump and recirculating pieces at the bottom with a black plastic mesh lid at the top. The bird bath sat on the black plastic lid and the tubing went up the center into drilled holes in the bird bath. The water went up into the bird bath and over the sides back down into the base to recirculate again. In that example, she had pots of plants and small flat rocks arranged on the rest of the black plastic lid so it was all covered up. It was quite small but very lovely and manageable :-). It always feels so good to finish a project…and your bags are beautiful. I love the fabric on the second one…not that the other isn’t beautiful! And I have always meant to try basket weaving and never have. Wow that Ladies Luncheon looks delicious! I’d love to have a pond but it looks like a lot of work! Lovely bags and cheerful flowers. You are finding every possible way to have fun! I really like the blue and brown bag you made and the basket! My only disappointment is what we didn’t get a photo of the fascinators . . .
And, that omission was on purpose. 🙂 But, if you are ever involved in a tea, by all means make some because I’ve never laughed so hard. You certainly are busy but in such a fun and productive way. How nice to have friends that share their talents. I admit that I had never heard the term “Fascinator” and had to google it. Oh my, what lovely creations they are! I have no idea where I could wear one (maybe opening day at the races?) but I so want to. I wonder if people would look at me funny if I wore one to the grocery store? That’s the thing about retirement, we just don’t have many fancy events to attend. Love your gorgeous bags! It sounds as if you’ve found a really good fit for your winter home. Flowers and sewing and fascinators, oh my. Judy, I absolutely love everything about this post. My community is having a Kentucky Derby party and all the ladies are busy preparing their Fascinators. You are so fortunate to be among women who are creative and love to share their knowledge. Carry on! Ha. I can envision gardeners of the future pulling out their smartphones and activating the Pollination App. for their own RoboBees. I guess, you’re right about the phone, app, and bee. I don’t know whether to laugh or cry. Sounds like you’ve been having fun! Those Azaleas are beauties. What a splendid way to spend your days 🙂 That bag is downright swell! My mother makes baskets. I love baskets, so I am a lucky girl! The pips are up here, and sometimes it feeeeeels like spring, but it’s rather off and on. I thought of you several times as I attended card making classes. I didn’t achieve anything like your pieces of art, but I did enjoy myself. 🙂 Hope your parents are all settled into their new home and enjoying it immensely.